The Australian Renewable Energy Agency (ARENA) extended its support in 2017 for further commercialization of the HCPV technology developed by Raygen. Their 250 kW dense array receivers are the most powerful CPV receivers thus far created, with demonstrated PV efficiency of 40.4% and include usable heat co-generation. In practice, the higher current densities and temperatures which arise under sunlight concentration may be challenging to prevent from degrading the cell's I-V properties or, worse, causing permanent physical damage. Such effects can reduce the ratio FFχ/FF by an even larger percentage below unity than the tabulated values shown above. To prevent irreversible damage, the rise in cell operating temperature under concentration must be controlled with the use of a suitable heat sink. Additionally, the cell design itself must incorporate features that reduce recombination and the contact, electrode, and busbar resistances to levels that accommodate the target concentration and resulting current density. These features include thin, low-defect semiconductor layers; thick, low-resistivity electrode & busbar materials; and small (typically <1 cm2) cell sizes. Similar to traditional PV, the peak DC rating of a system is specified as MWp (or sometimes MWDC) under concentrator standard test conditions (CSTC) of DNI=1000 W/m², AM1.5D, & Tcell=25 °C, as per the IEC 62670 standard convention. The AC production capacity is specified as MWAC under IEC 62670 concentrator standard operating conditions (CSOC) of DNI=900 W/m², AM1.5D, Tambient=20 °C, & Wind speed=2 m/s, and may include adjustments for inverter efficiency, higher/lower solar resource, and other facility-specific factors. The largest CPV power plant currently in operation is of 138 MWp rating located in Golmud, China, hosted by Suncore Photovoltaics. ^ Fernández, Eduardo F.; Almonacid, F.; Ruiz-Arias, J.A. ; Soria-Moya, A. (August 2014). "Analysis of the spectral variations on the performance of high concentrator photovoltaic modules operating under different real climate conditions". Solar Energy Materials & Solar Cells. 127: 179–187. doi:10.1016/j.solmat.2014.04.026. ^ Jo, Jin Ho; Waszak, Ryan; Shawgo, Michael (2014). 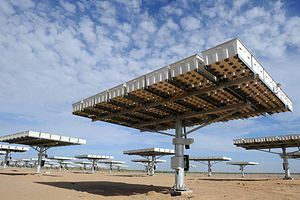 "Feasibility of Concentrated Photovoltaic Systems (CPV) in Various United States Geographic Locations". Energy Technology & Policy. 1 (1): 84–90. doi:10.1080/23317000.2014.971982. ^ Yupeng Xing; et al. (2015). "A review of concentrator silicon solar cells". 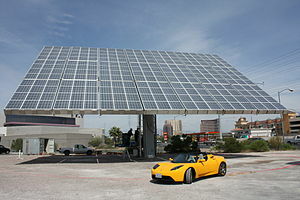 Renewable and Sustainable Energy Reviews. 51: 1697–1708. doi:10.1016/j.rser.2015.07.035. ISSN 1364-0321. ^ Gerstmaier, T; Zech, T; Rottger, M; Braun, C; Gombert, A (2015). "Large-scale and long-term CPV power plant field results". AIP Conference Proceedings. 1679: 030002. doi:10.1063/1.4931506.